As a member of the royal family, Meghan Markle will have (occasional, if-the-Queen-permits-it) access to some of the most iconic and expensive pieces of jewelry in the world. Even so, there is one pre-royal piece of jewelry the former actress has already set aside to pass down to her future daughter-and it's probably not what you'd expect. This latest Meghan tidbit comes from an interview she did with Hello! magazine in 2015, almost a year before she even met Prince Harry. In the interview, she talked about one of her biggest personal splurges: a Cartier watch she bought for herself to celebrate her USA show, Suits, getting a third season. 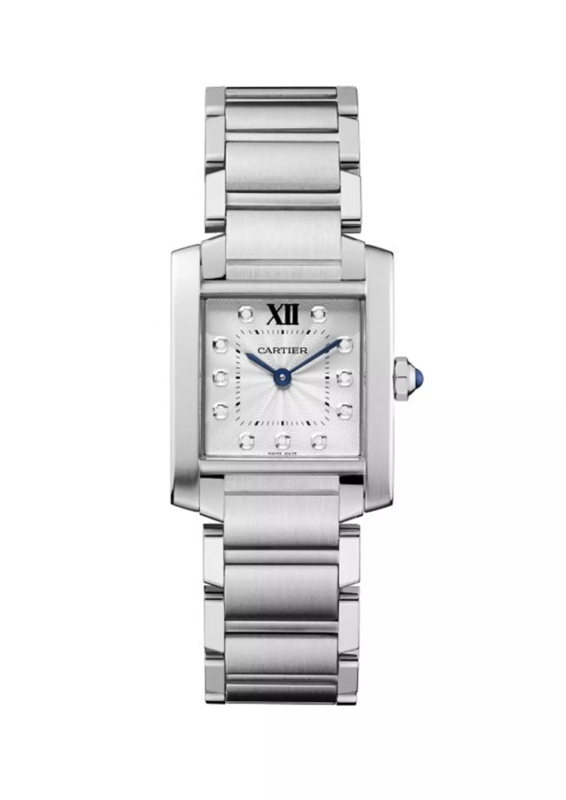 "I’ve always coveted the Cartier French Tank watch," she said. "When I found out Suits had been picked up for our third season – which, at the time, felt like such a milestone – I totally splurged and bought the two-tone version." Finally having the means to buy yourself something you've always wanted is a big milestone for anyone, but what makes Meghan's watch special (and a future royal heirloom-NBD) is the engraving. "I had it engraved on the back, 'To M.M. From M.M.' and I plan to give it to my daughter one day,” Meghan explained. "That’s what makes pieces special, the connection you have to them." According to Meghan's quotes, she probably would have purchased in late 2012, when Suits was renewed for its third season. Throughout 2013, Meghan was photographed wearing a watch that appears to be her beloved Cartier. She even seems to be wearing it on an episode of Suits, which would just be extra iconic and probably makes it the first royal heirloom to appear as a prop on basic cable.